Would you like to be able to get yourself out of pain, even chronic pain? It's possible. Why are we so sure? For one thing, hundreds of thousands of people have done it. This therapy has a 95% success rate. 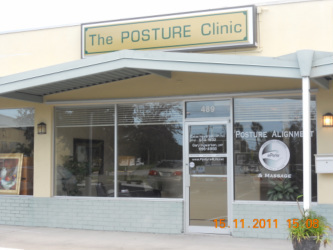 The Posture Clinic, located in Vero Beach, Florida is owned by Catee & Gary Ingwersen. Catee is a Posture Alignment Specialist certified by the Egoscue University. She is a Corrective Exercise Therapist trained by the National Academy of Sports Medicine. Catee is also a proud member of the Applied Biomechanics Associates (ABA), a worldwide network of certified practitioners trained by Egoscue University, providing innovative joint and muscle rehabilitation. Members of the ABA are experts in human biomechanics, posture, alignment, joint, and muscle rehabilitation. Their mission is to help clients prevent or eliminate musculoskeletal pain and improve neuromuscular function quickly and easily and help to improve athletic performance and quality of life. Are you ready to get yourself out of pain? We're here to coach, empower, and encourage you. We'll help you but it is totally up to you. You may need to change your beliefs: replacing "What's wrong with me. Can you fix me?" with "What is my body trying to tell me. Where is the underlying cause of my pain. Could my flat feet (or hiked up hip) be causing my hip (or neck or shoulder) pain?" We'll give you the resources over the course of your sessions and if you have truly done your homework and have committed yourself to the process, you'll be a different and healthier person. Catee Ingwersen is a licensed massage therapist. She has been a licensed massage therapist in private business in Vero Beach Florida for 15 years. "What I noticed having learned and experienced numerous kinds of therapy (and having to search out the real causes of and solutions for my chronic pain), that very very few therapies and health interventions, conventional and alternative medicine, look at or focus on the entire body when treating PAIN! The focus is solely on the area with pain. Who is looking at the bigger picture - the whole body, the whole musculoskeletal system? In Posture Alignment Therapy, we won't be chasing symptoms around your body." We treat the body as a UNIT. Everything in the body is integrated, especially the Musculoskeletal system. A disturbance in a muscle, joint, structure will deeply effect the other joints, muscles and structures, cascading through the entire structure. It is a fact: muscles move bones. Bend your arm, various arm muscles did the job to pull two bones closer together, bending the elbow. Muscles can move bones out of place over time and can move those bones back into place too - with the right stimulus. You may say, "oh, I do plenty of exercises." Has the exercising and other health interventions helped? Why are you still in pain? Because it is not the right kind of movement for your body. Strengthening your pecs or abdominals won't get the major load bearing joints lined up vertically and horizontally. The more you exercise in the gym, at home or otherwise, you are reinforcing, in fact, strengthening your postural dysfunctions. Manual therapies where someone does something to you (massaging, Rolfing, manipulating your spine or meridians or arms and legs) are PASSIVE. Don't get this wrong, those methods are wonderful but have their specific place and purpose. However, this often does not lead to long term or permanent Pain resolution. This is because you are passive and the therapy does NOT require any actual use or demand on any joints or muscles that are dysfunctional. Further, these manual therapies usually are "body part" specific and are not treating the body as a unit. If it hurts, rub it, adjust it, fix it, give it a rest, wrap or sling it, elevate it, inject it, remove it. First look for the underlying cause, examine the entire body for posture misalignments, do functional tests and put a demand on those areas that are deviated from the blue-print optimal functional design. 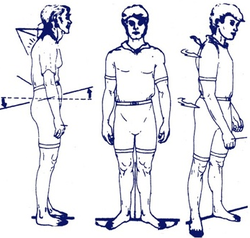 Have the person actively use their body gently and systematically to get all load bearing joints lined up vertically and horizontally, bearing weight equally front to back and side to side. Manual therapies can't always resolve Pain because they don't require the person's joints and muscles to move and bear weight equally, to neurologically fire and unlearn dysfunctional movements or to move systematically. This Posture Alignment Therapy is a system of reinstituting "demand" on all structures and muscles....it's not any old demand but systematic demand which is very specific and focused at returning your posture, skeleton and bones to the original blueprint design God gave you. The knock knees, the forward leaning of your spine, the sway back, the excess lumbar curve (which always results in herniated discs), the straight lumbar or cervical curves or Dowager's hump, scoliosis, the rotated, elevated parts, CAN BE HISTORY.